Masterful storyteller Laura Frantz continues to unfold the stirring saga of the Ballantyne family in this majestic tale of love and loyalty. This is the Ballantyne Legacy. Love's Awakening is the second book in The Ballantyne Legacy series, and the books just keep getting better and better! In Love's Reckoning, there were several moments where I just floored at the turn of events. In Love's Awakening, I experienced that too, along with heartbreak, and joy. 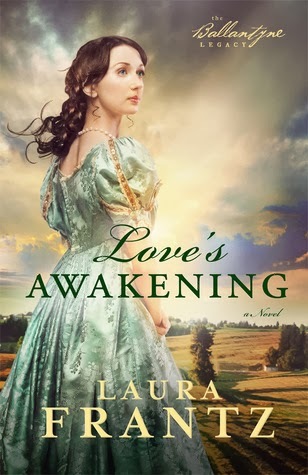 Love's Awakening follows the Ellie Ballantyne, the youngest daughter of Silas and Eden Ballantyne. Ellie leaves her finishing school before her term is over with, but believes she is quite finished. On her way home, the carriage she is riding in, along with many other on the road are caught in a massive storm that is reeking havoc on the country side. While waiting for for the storm to let up, she is forced to seek shelter in a tavern, and it is there that she runs into a long time neighbor, and family rival Jack Turlock. Going against his reputation, Jack helps Ellie reach her home safely and leaves her in care of her elder sister. From here, we follow Ellie as she tries to find her place in her family again. Her eldest brother is settled into running the family mercantile in town, her elder sister is capable of running the house with out help, and her younger brother is doing well with his music and the family's ship yard. Ellie pursues the idea of a girls day school. One of her students is Chloe Turlock, Jack's little sister. She proves to be just as sneaky as her father and eldest brother Wade, but she has a sincere heart like her brother, Jack. In the time spent together, Ellie is able to learn more about Chloe and her brother Jack, who has taken Chloe on to raise, and see that they do not take after the family's bad reputation. There are things that do keep Ellie away from Jack, his family is pro-slavery and into making whiskey, while her family are firm abolitionist and secretly helping in the underground railroad. Love's Awakening isn't just a love story, it is also a story of finding out who you are, and where your place truly lies. It also has several instances where I could not believe "that" just happened! And I will admit, I got a little misty eyed in a couple of scenes. Love's Awakening grabs a hold of you and it doesn't let you go! And what an ending! I can't wait till the next book in The Ballantyne Legacy! *Sigh* Now you're making me wish I had read the first one so I could quickly grab this one. I'm so looking forward to diving into this series. So good to read this, Kate! Thank you. Ganise, At least now you can read them back to back! :-) I hope you enjoy them as much as I have, when you get to them!